Kelowna’s #1 kids birthday party magician has appeared! Transform your child’s birthday party into a magical and memorable occasion that will be remembered for a lifetime! Professional children’s entertainer Leif David is the busiest entertainer in Kelowna performing over 300 family shows annually. We guarantee a hassle free birthday party for you, and a memorable birthday party that your child will LOVE. Plus, all the kids and parents will be talking about how great the birthday party was long after it’s over. Based out of Kelowna BC serving the entire Okanagan Valley including Kelowna, Penticton, Oliver, Osoyoos, Vernon, Salmon Arm, Merritt, and Kamloops. 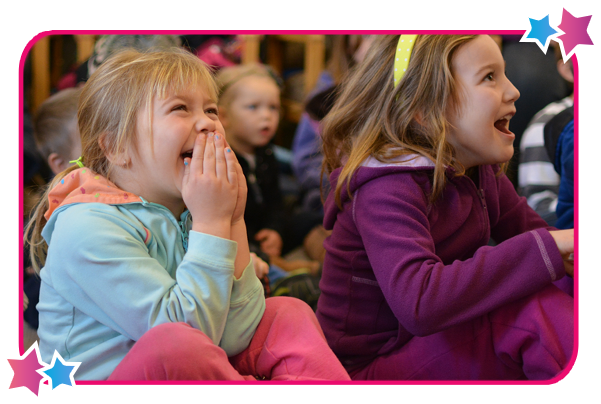 The Hassle Free Birthday Magic Show has a running time of 45 minutes and features magic routines performed to music, lots of audience participation, and a chance for the birthday child to volunteer and help Leif David perform magic in front of all their friends. Your guests will be engaged no matter the age because each performance is tailored to the age group of your audience. Plus Leif David, with the help of the birthday child, will make a wizard hat magically appear that they get to keep as a gift. There’s no maximum on the number of people you can have. Feel free to invite friends, family, and brothers and sisters along, the bigger the audience the better! Book your date today. Call Leif David at (250)575-7469 or fill out our online form. Save time and energy with these Magic Wand Goodie Bags – guaranteed to make the magic last long after the party is over. Leif David will bring exactly enough Magic Wand Goodie Bags for everyone at your party. When you purchase wands for everyone at the party Leif David will include a 10 minute workshop after the show. Leif David will teach the kids how to perform a few magic tricks using the magic wands. The wands make for a great souvenir of a magical birthday party. Leif will present the birthday child with a “How to be a Magician” DVD during the show. 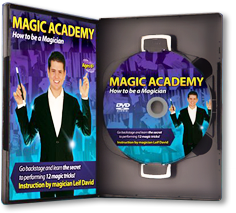 The “Magic Academy: How to be a Magician”DVD demonstrates 12 easy-to-learn magic tricks for kids. Leif teaches six magic tricks with the included magic wand, and six more tricks with items found around the home. Plus there’s three additional bonus features. Learn more our about birthday party magic wand goodie bags and extras. Reserve Your Date Today for your Child’s Birthday Party! Absolutely the best birthday party ever! Great flow to the show, super funny, very interactive with all the kids. All adults loved it as well! I would highly recommend this for any family looking for a unique and fun birthday idea! Thank you Leif!